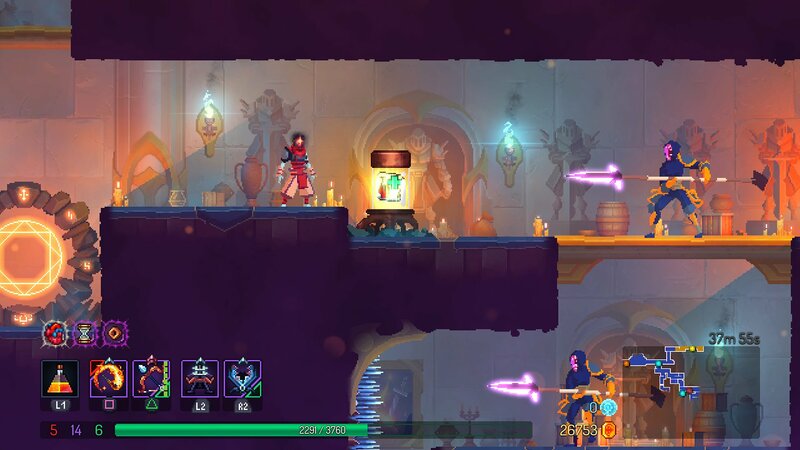 I’m almost starting to feel guilty about how much time I’ve been sinking into Dead Cells. Straight up, I haven’t been this into a roguelike game since Spelunky back in 2012. I’m sneaking in at least one good run a day, and “one good run” could easily take up to a dozen unsatisfying attempts to pull off. I thought that beating Dead Cells would slow me down, but if anything, killing the Hand of the King has only reinvigorated me. The variability in character builds, the branching levels, the acrobatic movement mechanics, and yes, the steady grind toward unlocking every last item — it’s all so alluring. I’m not confident enough to turn on post-game difficulty modifiers as my default Dead Cells experience, and that’s due to one major sticking point: the Lancer. Every tricky action game has that one specific enemy type you can’t reliably deal with, and for me, it’s those jerks with the spears. I hate ’em! Those sly dogs have it all figured out. They can stab you through walls, floors, and ceilings. They’re often situated near other foes that don’t let you stand still and plan, so it’s not always easy to get the drop on them. They have a long reach and a three-hit attack that’s deceptively hard to dodge. My solution? Leaning even harder into my preferred playstyle (damage-over-time Tactics builds) and fighting them from a safe position. Or, barring that, stunning/freezing them and going all out. How’s Dead Cells treating you so far? What’s giving you the most trouble?